It takes 24 hours for the sun to circle the earth, 21 days to change a habit, 120 days to get over a crush and only 10 seconds to find peace. A long time ago I wrote that "a breath and a smile before saying anything, changes everything." It's true. Smile while inhaling through your nose for a count of five, exhaling through your nose for another count of five and feel the rhythm of your heart mellow. Do it a few more times, and feel your entire body relax, your perspective change and a general sense of calmness flutter through you. Whatever you encounter today take a moment to breathe and smile before responding. If it is something amazing that will happen to you, then taking a moment to let it sink in allows you to fully appreciate it. If it is something unpleasant that you are dealing with, then this pause lets you reason rather than react emotionally. 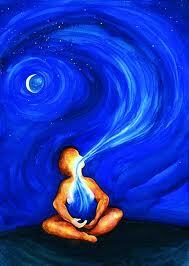 The ten seconds it takes for a full in-breath and out-breath changes the moment, neutralizing any extreme emotion. These ten seconds can not only change the moment, they can change your day and the outcome of any situation. Smile, breathe...(in) ten, nine, eight, seven, six, (out) five, four, three, two...peace.